Shopping for a new home is exciting and possibly overwhelming, especially if you're a first-time buyer. Once you cross the threshold of a prospective home, it can be hard to look beyond perfect staging and focus on key elements of a house. Keep in mind your goal. At the end of a showing, you'll decide either to cross off the house from your list or keep it as a property you will consider purchasing. Begin your assessment of a home before you enter the door. The most important decision you make is where to live. Real estate agents emphasize the importance of location to their clients because it will greatly affect the value of a home now and the future resale value. Two exact houses can sell for very different amounts based solely on location. You will need to consider the following factors. Safety: Look for signs that neighbors trust each other and feel comfortable in their space. School district: Even if you don't have children, it's important to be aware of the quality of education offered for future resale value. Convenience: A long drive to work, shopping, entertainment, or community events eats up time that could be spent doing other things. Access: Public transportation or quick access to major traffic arteries is important to people who live in major cities. View: A home located on water or with a panoramic view is desirable. Before entering a home, sit in your car with the windows down and spend several minutes listening, smelling, and observing. Become aware of house's outdoor environment. Are there loud noises from cars, planes, trains, schools, hospitals, businesses, or fire stations? Breathe in deeply. A distant factory or farm can be the source of either pleasant aromas or foul odors. Look around. What is the general appearance of the neighborhood? Are the homes and yards well maintained? If you buy this home, will you be able to step outside and enjoy your view of the neighborhood? After exiting your car, take a few minutes to note the landscape— both the living "softscape" as well as the hardscape surrounding the house. Large shade trees add value; however, dead trees can be expensive to remove. Does the grade of the yard slope away from the foundation so rain and melting snow flow away from the house? If the house is near a body of water, is there potential for flooding? Have the shrubs, plants, and lawn been maintained? Note the condition of the driveway, sidewalk, steps, and patio. Are they sound or do they require repair or replacement? Consider the durability of the materials used: concrete, asphalt, or another material, such as stone or brick. Does the driveway provide ample room for parking and maneuvering a vehicle? How difficult will it be to clear snow from the driveway and sidewalks? Is there a fence? Note the materials, condition, and how well it fits in with the other neighbors' properties. Is it ornamental or will it keep pets and children safe? 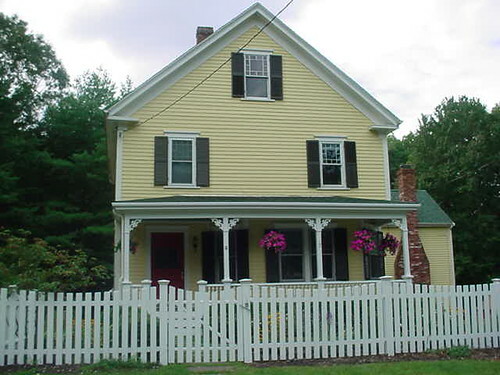 A classic picket fence requires regular maintenance to keep it charming. A roof is one of the key elements of a house because it's the first line of defense against water damage inside the home. It is also one of the more expensive elements to repair or replace. The shingles should lie flat and have uniform coloring, free from moss and mold. Note any missing shingles, patches, and cracks. Rotting boards or sagging spots are a sure sign that the roof needs repair or replacement. Keen observations outside will prepare you to look for signs of water damage inside the house. Check for gutters and downspouts that direct water away from the foundation. If you see granular deposits at the end of a downspout, the shingles might be wearing out. A properly maintained exterior creates curb appeal and protects the home's interior features. Next check the siding and window trim for any maintenance issues that go beyond a fresh coat of paint. Look for cracks, gaps, and holes that might allow moisture, insects, and animals into the home. Mold, termites, or carpenter ants can cause extensive damage. If siding has begun to rot or crumble, it will need to be replaced. Warped siding likely indicates underlying water damage. Again, note locations of concern and check the corresponding locations on the interior of the house. Climbing ivy has a certain curb appeal; however, it can invite trouble. All houses settle into the ground over time, so small cracks in the foundation are common. Be on the lookout for large cracks or gaps that indicate a more significant problem. Once inside the house, check for doors or windows that don't open freely and uneven floors. These indicate that settling of the foundation has occurred. When a home has been freshly painted and staged to highlight its advantages, enjoy the scene for a moment. Then, look past the surface and focus on key elements that might be expensive to change, repair, or replace. Take a moment to appreciate the of a well-staged home. Are there any odors or overpowering scents used as an attempt to mask an odor? Odors from pets, cigarettes, mice, and other vermin can linger no matter what a homeowner does to eliminate the source. Odors caused by mildew, mold, or plumbing and septic issues can be costly to remediate. How do you feel? The heating and cooling system should work efficiently to keep the air at a comfortable temperature and humidity level. Note drafts that hint at poor insulation or low-quality windows. Deficiencies such as these will significantly increase monthly energy bills. Look at cabinetry and wood trim for fit and finish. Quality workmanship shows when trim, molding, and baseboards fit tightly together. If you don't like the wood finish, imagine what they would look like with paint. Tile in a kitchen and bathrooms should be evenly installed. Unsymmetrical tile layouts may indicate a DIY job, which can be fine if it's been done well, but may lead to problems if the homeowner was not skilled. Look for overall cleanliness on major surface areas, such as walls, flooring, countertops, tile, appliances, and bathroom surfaces. Is the paint faded? Are the floors showing wear? Was carpet laid over hardwood flooring to conceal damage? Are there burned-out light bulbs? Look for signs that indicate either a well-maintained home or a neglected one. A clean kitchen is both attractive and necessary for safe food preparation. Think about how you live and any special storage needs you have. Are there closets, built-in cabinets, or adequate wall and floor space for freestanding storage units to hold your belongings? An existing home has been optimized for the current owner's routines and possessions, which may be very different than your own. Even a new home is designed for a specific target market that might be different from your life stage and lifestyle. Therefore, you can gain greater insight as to whether a home suits your needs if you take time to walk through your daily routines as if you lived in the house. Ask yourself the following questions. Do the bedrooms have enough closet space? Will your beds, dressers, and nightstands fit in each of the bedrooms? Does the kitchen meet your requirements for storage and layout? Consider where you'll store your pots, pans, serving dishes, everyday dishes, and food. Do you prefer to keep a well-stocked pantry? Do you need to accommodate multiple cooks? Do you prefer an eat-in kitchen? Where will you enter and exit the house every day? Is there a launchpad for keys, coats, boots, shoes, backpack, briefcase, and/or purse? Are there a lot of steps to consider when you're carrying in groceries from the car? Is the laundry room easily accessible for everyone in the family, especially while carrying a hamper full of clothes? Is there a laundry chute? Do you need a home office? When you want to relax, what are your needs? Will your existing furniture and entertainment system comfortably fit in the space or will it feel cramped? Do you have children or want to plan for them? Do you want to accommodate guests? What will their space needs be, and how might that change the traffic flow through the house? Do you have a hobby that requires a room of its own or space in the garage? Do you own a pet? How much room do you need to store food and equipment? Will a large dog running through the house make the halls feel narrow? Do the windows provide ample natural light and ventilation? Consider the orientation of the house on the property. A house in a cold climate feels warmer when oriented toward the south, and a house in a hot climate will feel cooler if oriented toward the north. Is there storage for your sports equipment, outdoor furniture, and lawn equipment? Is the garage large enough for your vehicle(s) and other storage needs? Take time to consider the purpose of your home now and in the future. It's time to take a hands-on approach. If you're looking at an older existing home, turn everything on and off. Check faucets for small leaks; look under the sink and inside cabinets. Make sure all the light switches work. Flush the toilets. Turn ventilation fans off and on. Open doors and windows, including the garage door, and make sure they operate smoothly. Even a quick inspection can reveal potentially costly problems. Continue to look for signs of water damage near a water heater and sump pump basket. Check the ceiling, walls, and flooring for discoloration and mold. Closets may be the best place to spot this, as these spaces are often overlooked as a homeowner preps the home for showing. Also, check windows for signs of water damage caused by outside sources or high humidity. Look at the furnace and air conditioning units. Sometimes service technicians leave a sticker that indicates regular maintenance. You can also slide out the furnace filter to see if it's clean—a very dirty filter may hint at a homeowner who routinely overlooked basic maintenance. Be mindful that a house might be in your price range; yet, the property taxes or homeowner association fees might be higher than you can comfortably afford to pay each month. If there is an association, ask what services and amenities are included and whether the association is professionally managed. If you're still interested in a house and want to take the next steps with a realtor, you'll want a professional to conduct a home inspection to protect your investment. Tracie is a technical writer who earned her home and garden expertise while extensively remodeling two homes, custom-building a new home, and designing and building a cabin. Additionally, she and her husband, a former landscape professional, have created gardens that feature native plants and locally-sourced limestone. Tracie loves a cozy minimalist home and sews her own pillow covers, quilts, and curtains. Learn more at RicefordStreams.com. How Do I Know If My Home Was Damaged by an Earthquake?